Every once in a while, I realize how much I miss teaching Sunday School. Each week, we’d dive into a new piece of the bible and dissect it, examine it and explore it until it not only became clear, but took on a whole new significance in our lives now that we’d read it. I miss not just that, but writing my notes for each lesson. It was almost like writing a full sermon every week and each week, I’d try to give the young adult class my best little sermon. I barely remember any of them now, but tonight while writing, I’m beginning to remember parts of one I may have written long ago as I let my characters dive deeper into Luke 15. As I had Brit begin to explain verses 5 – 7, my mind went into the zone and the same “spirit” I called up to help me write my mini-sermons many months ago leapt to my heart and helped me write this portion of my book. I think it’s so easy for me to write about Luke 15 because I always carry it in my heart. Perhaps it’s because I look at my own Christian experience and can easily hold it again these three verses. Like no other part of the bible, these words speak to me and hold me when I forget the reasons why I even became a Christian five years earlier. I had a lot to say this evening about getting through this week without any distractions, but I don’t think all that is necessary. I wrote 692 words tonight (The woman and her coin) and found all of my inspiration from my favorite book and chapter of the bible. I’ve no desire currently to flip on the television and watch until my brain dissolves, but I have got the desire to be wrapped within the Word once more. If I have nothing else to show from these last nine days, I can always carry that. I’d never felt so calm beginning my day as I did this morning. I think I’ll need to start every day like today, which means I’ve now found some inspiration for waking up on time. I’ve found that I like to wake, take a shower, get dressed and then lean in my desk chair with my socked/stockinged feet propped on the bed and read for twenty to thirty minutes before I head to first-job. Whether it’s the calm music playing softly behind me or the act of reading in itself, I’m not sure, but I am never so relaxed and calm as when I start my days this way. With eight days of living Xbox and television-free, I’m starting to get into a rhythm that I quite enjoy. I’m not pressed to do or achieve anything other than my 250 written words each day. Everything will be fine. I’ve said this to myself many, many times previously, but it’s only now that it’s taken on real significance. I doubt that I would have handled what happened yesterday as well as I did if I hadn’t already been in this cycle of mental cleansing…and the bad thing is that I don’t think I handled things well at all. I wrote 436 words tonight (the angels of God over one sinner that repenteth). Not counting the 76 words lifted from Luke 15, I wrote 360 (she kicked him under the chair before he stood). I’d thought of some interesting things that I wanted to blog about earlier in the morning, but as I hadn’t had the chance to commit the idea to paper or iPhone, those words are now long gone. Back to my reading…. I find myself liking Hannibal more and more as I read, but not because it’s written well or because I’m fully engaged with the book, but because I love the idea of Lector and I just want to get to the end of the book when I know he and Starling run off together. I know this because someone ruined the ending for me just as I’ve done now for anyone who happens to be reading these words. I don’t know how or when or why, but I know it’s coming and I just want to “see” the end so I can be done with it. Reading the book reminds me a lot of when I was reading Harry Potter and the Deathly Hallows the weekend the book was released. I’d gone to a midnight party as I had for Books 5 and 6, though I wasn’t dressed in Harry garb this time and looked on the whole thing with a twang of nostalgia for how I’d spent my early college years. When I got my copy, I turned off the television, avoided the phone and did not turn on my computer for nearly 48 whole hours as I attempted to get through the book without someone ruining the ending for me. I just knew that if I turned on anything or spoke to anyone who was as enamoured with the series as I had once been, that someone would shout out who dies in the end or if Harry made it through unharmed. I more or less enjoyed the ride, but mostly because I just wanted to be done with it, not because I particularly enjoyed the writing. This is where I’m currently placing Hannibal as I fight every urge to just go to the last location on my Kindle and read backward until I find what I wanted to know. I’m trying to enjoy the ride and enjoy the story as much as I can and I’ll admit that the book has now jumped from two stars to almost three for me, but really, I just want to see the end. I’m not sure if this has anything to do with my current quest for mental enlightenment, with which this book will certainly not help, but I can feel the end approaching. The point, I suppose, is what I’ll do with myself once I’ve reached the end. Seven days into this quest of mine, I came upon a true test for myself. Instead of being racked with boredom, I was pained with stress so deep that it made me physically ill and had I not been the calm and composed Christian I am, may have caused me to do harm, either verbally or physically. I’m thankful today that I have my mother who can talk me down from rage and help me see myself in a different colour. I was livid this evening, as I am still quite livid now, but I realize that it’s not at the person – my former assistant – nor is it at the situation – me putting my neck out there for him, only for him to display utmost immaturity at my expense – but what had me in a rage so strong that I momentarily saw stars and a pain started to ache in my stomach, up through my chest and around my back, was that I was wrong. I had made claims about something and I had been certain and, yet, I was wrong. This fact alone is the cause of my rage; sure, correct, straight-forward and knowledgeable to the point of arrogance Dorienne was somehow proved incorrect. I said as I left first-job today, that I didn’t care about this little test of mine and that to de-stress I was going to sit in front of my TV and watch old shows and then play Rock Band until I couldn’t see straight any longer and today of all days, I think I would have had the perfect excuse for it. But in a moment I can only call providential clarity, I told myself that tomorrow, I’d be so much angrier that I’d let anger drive me from a goal that I would probably have a stroke at 26 from the anger piled on top of the anger. I did tonight what I set to do which was have a little dinner and read. It took quite a bit of pacing in my bedroom and in the kitchen and two lengthy talks with my mother and a friend, but I eventually calmed to fall in and out of the fictive dream of my book and eventually begin writing. Normally, when I’m upset, I can write out any emotion and all will be well once I’m done, but when I’m livid…so full of rage that I can feel my blood moving, I’m not capable of enough rational thought to even remember who Damen Eisengardner is. Like my mother says, I’ve got to find a way to manage this rage; find a way to pump it into something creative or at least useful instead of bottling for the sake of a composed demeanor. I wrote 357 words tonight (through the door, shutting it behind her) and I think know what helped bring me to the calm I have currently, is not the music playing softly beside, but because I ended tonight’s session with a meager stroll through the bible, looking for quotes. I was a little ashamed that I really couldn’t name any off the top of my head, but I’ve long since decided that memorizing bible quotes and passages serves me no purpose. I had to memorize Psalm 23 and the Beatitudes to pass the second grade, but I can recite Psalm 23 now because I heard a gospel song for it and I can barely remember where in the bible the Beatitudes are (fine, I looked it up: Matt 5:3-12). I have my favorite passage of course (Luke 15:3 – the parable of the lost sheep) and if I think really hard, can remember the line which makes me excited to be a Christian at this point my life (Rejoice with me; for I have found my sheep which was lost) and makes me a tear a little when I think of it, but I’ve rarely seen a ton of value in memorizing verses. Perhaps I should, though. It was not until I started to search for and read these quotes I used to show some banter and characterization that the rage finally started to ebb and I started to feel some peace. Rejoice with me; for I have found my sheep which was lost. Yeah, I like it. I like it a lot. So, it took six days of no television and no Xbox before I finally broke down and started cleaning. I had hoped this would come earlier, but such is life. Having finished The Silence of the Lambs yesterday, I turned my sights to Harris’ fourth novel Hannibal. It’s got only 3 stars on Amazon and the reasons for this are clear. I’m not yet a third of the way through it and I’m already wishing I’d chosen something else to read. I had got up for the bathroom and stared at my Kindle on the bed and wondered what to do. I could either go back to the boring book, or I could start cleaning. So I started cleaning. 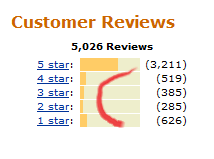 I’ve realized in these past few days that Amazon product reviews follow certain curves depending on how good they are. While there will always be idiots rating a book or film low because it arrived with bent pages or because the shipping took too long, the majority of the reviews are more or less genuine. Since most of the reviews are about content, one can tell how good a book is just from it’s review curve. If the curve is more logarithmic (i.e. going up and towards the right) with the bulk of the reviews being favorable with a few less being 4 stars, a few less being 3 and so forth, the odds are, the book is pretty decent. The trouble begins when the reviews are more hyperbolic where there are many favorable reviews and just as many if not more negative reviews with few 4, 3 and 2 star reviews between them. It’s rare that a popular book will receive a ton of negative reviews, hence the reason it’s popular, but when one can see that the negative reviews outnumber the others, problems are present. The curve on Hannibal Rising is so dreadful, I doubt I’ll ever even want to watch the movie if it comes on Netflix. Now, I’ve not read Twilight, but that curve is a bit of a deterrent. The favorable reviews far outnumber the unfavorable ones, but there are definitely more 1 star reviews that 4, 3, or 2 ones. That’s not natural. Ideally, a good book should be liked by many, liked less by fewer and so forth as shown with the Silence curve. I’ve got Twilight sitting on my Kindle and I’m barely into the second or third chapter, but I’m afraid to go further because I know lots of people who love it and I don’t want to read and then lose all respect for all of them for reading rubbish. Not that I’ve not read rubbish books myself, but Harry Potter is at least a good story and more or less well-written…at times. Enough about other people’s books…I wrote a ton today. Technically, for counting purposes, I wrote 389 words (against the chair in a huff with her eyes closed. ), but when I look at all the notes I wrote for Jill’s story, I’m up to 8,203 words in a day, the Damen piece included. It all started with what was supposed to be a short note in Awesome note about how Jill should take place in a town called Georgeton (previously Georgetown, but then I saw there was, indeed, a Georgetown, Ohio), but after describing the town through Kyle’s eyes, I went overboard and just kept writing about everything that happened to him right up to the point where he met Sam and fell in love and then they get Jill. I doubt much of what I’ve written will end up in the final project for Jill, whenever/if ever I get to that point, but I just loved writing it. Kyle’s simultaneously like everyone I’ve ever written, but still the opposite of anyone I’ve tried to write. How does a straight woman get inside the head of gay man? I’m not entirely sure, but I think I got very close to it while writing today. It’s certainly not as easy as the stereotypes make it seem, especially when one is trying very hard not to create just another stereotype here. I’ve moved the notes for Jill into a Word doc from OneNote’s chaos, so now it’s a real, official project that waiting to be completed. Today, the characters just wouldn’t shut up long enough for me to stop writing and I had another one of those days where I write and write until I physically can’t do it anymore because I’m too low on electrolytes and blood sugar. I love those days. Back to Hannibal; I’m only reading it at this point because I’ve heard the ending was better in the book than in the movie and, since books are always better than their film adaptations and that film was god-awful, the ending is bound to be good. Hopefully. I’m a little tired since I got up so early this morning in hopes of arriving at Sunday School marginally on time. I wasn’t horribly late, but it was nice to be in the sanctuary before the choir sat down and before Pastor got up to speak for once. I nearly cracked today when trying to figure out what to do with myself. I wanted to do nothing more than fire up Rock Band and play for the remainder of the afternoon, but at this point, I want to see this through as more of an exercise in willpower than anything else. If I can write every day for five months and post here every day for six months, then I can go a week without Rock Band…and even a week without doing other destructive things like overeating, wasting the day and pretending my problems don’t exist. I read for the majority of the day, finishing a book I hadn’t read in a while (Silence of the Lambs) and finding several others I’d like to read in the next few days. I can legitimately say days since I’ve suddenly found myself with oodles of free time now that I’m not wrapped around my Xbox all day. I wrote 315 words today (reading “14 thru 17” across the frame.) and I went to church. Nothing entirely remarkable, but, all in all, a good day. After I’d finished writing yesterday, I decided to take all my new Harry notes and add them to the old file. I searched for ten minutes before I found what I thought was the old file, but after reading through 20+ pages of notes, I remembered that there were some great scenes I’d written that weren’t included, so I off I went further into to the folders of shared drives across my three PCs in search of this file. On this journey, I found what I can only describe as “old friends” neatly tucked away in various folders. I probably scanned through several dozen little beginnings of stories while searching for this file, many I could barely remember starting and many more I couldn’t remember the story. Instead of watching my movie last night or even reading, I spent the majority of the night reading through a dozen of my long, but harried notes from one story and then another. I made a lot of X-Files stories in the past decade and if I make it to 100, I probably still won’t have enough time to flesh out the dozens of book and short story ideas I’ve got littered around my external hard drive. Some of these notes hadn’t been touched since 2003. 2003! I may have been 19! To think that I’ve got all these stories just sitting there…waiting for me. I have to say that stepping away from the Xbox and the television has made everything appear more vivid. I’m suddenly anxious to do nothing more than write and read, read and write. As if taunting me with the desire to finish all my unfinished stories, I even got a message on an old SVU fanfiction I haven’t touched since 2009 asking me to update. I took the story with me today and if I hadn’t had so much actual work to complete, I probably would have at least read through what I’d written. I wrote 623 words tonight (started down the hall where Anthony had pointed) and unlike with most nights earlier this month, I’ve not had to struggle for each sentence or stare blankly at the screen wishing for inspiration on how to link two parts of the same scene. I’ve not even had to do more minor note-making before beginning my prose; I just sit and I start writing. I’d like to think that some of this has to do with writing this scene where Damen goes church and, if I’m honest, it probably is. The best thing about it though, it that it’s got me excited for the first time in ages to get to church. I want to go to Sunday School. I want to hear the message. These are really the only two things I want to accomplish tomorrow. Since I won’t be nerding it up and playing Rock Band or watching Frasier all night, I hope to be asleep at a decent hour so I can successfully make it to church and Sunday School on time. It’s the fourth day without my usual distractions and I already feel cleaner. I’ve gone three days without television or video games or non-classical music. I think I’m okay. Whether it was from a dream I’d had during the night or just a bout of inspiration, I woke this morning with the desire to make notes for this Harry story I’ve been wanting to write for the past five or so years. It’s probably the last fanfiction I’ll ever write outside of X-Files and SVU stories the pop to mind, but the more I write the notes for it, the more I start to love it. When I took a lunch today (an oddity in itself), I sat in my car and wrote about four pages of notes for the story, longhand! My handwriting has deteriorated to that of a drunken dolphin, so it will be a bit of a challenge to translate what I wrote into something that can be incorporated into the main notes for the story, but I could not stop thinking about it until I’d committed it to paper, real paper. I just wish that it was a burst of energy for Damen or Jill or Evan or Luka or any of my feasibly publishable projects instead of just fanfiction. I suppose I shouldn’t complain as writing is writing and I owe a lot to fanfiction as I used it to teach myself how I go about writing a novel, but still…there’s some frustration in spending the bulk of whole day on something that won’t mean much to anyone outside of myself and a few Harry fans. That said, I think half of what’s started this is that my mind’s a bit clearer than it has been lately. Perhaps today’s ideas have been floating in my head for months, but I’ve only now quieted all the other noise for long enough for these ideas to give me a real picture. The fact that I wrote longhand is an experience all on its own since I don’t think I’ve written anything longhand since Alex and the first phase of notes for Luka more than six years ago.